Once upon a time there was a girl. And she had long beautiful locks of blonde hair. She was tan and toned and her clothes fit her like smooth peanut butter coating a ripe apple. And then there was this other girl named Bev. 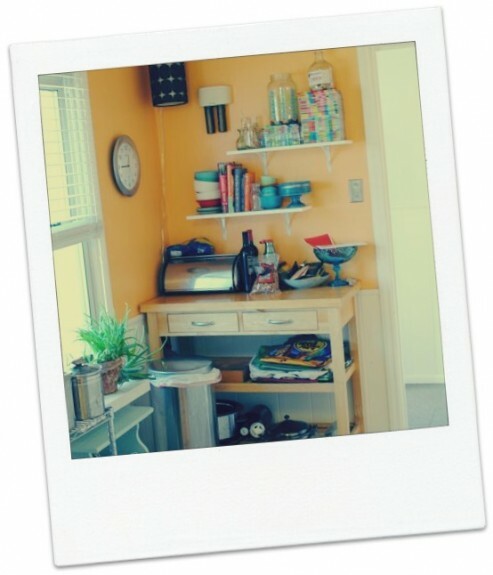 And she had this really orange kitchen. And it was just fine and cute and great and whatever and la la la for a good 5 years. After a round of texts with their dear friend/awesome home renovator/guy who did their bathroom only a few years before, Eric, it was decided. He would drive in from Colorado with a trailer full of tools and they would gut it and rip it and tear it to shreds and do the thang right. And they would also stop talking in 3rd person. This was the night the Blair Witch and her raccoon stopped by for a spell. 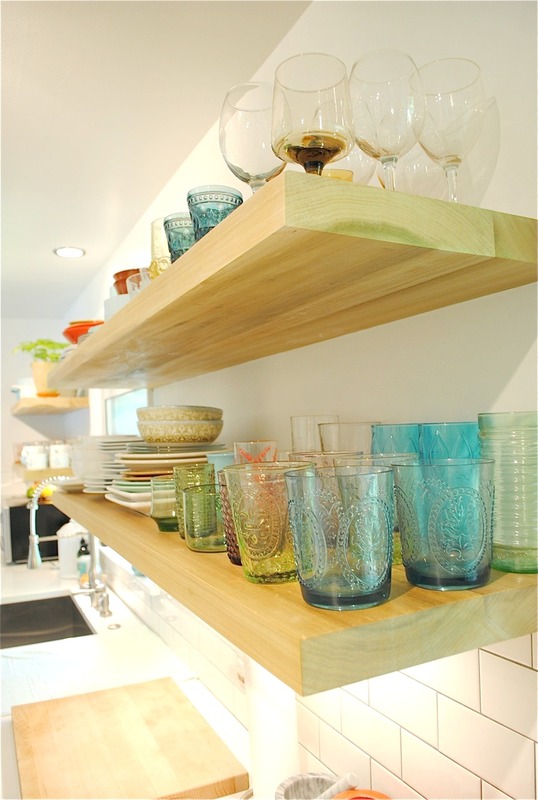 Custom built floating wooden shelves. Death becomes me. 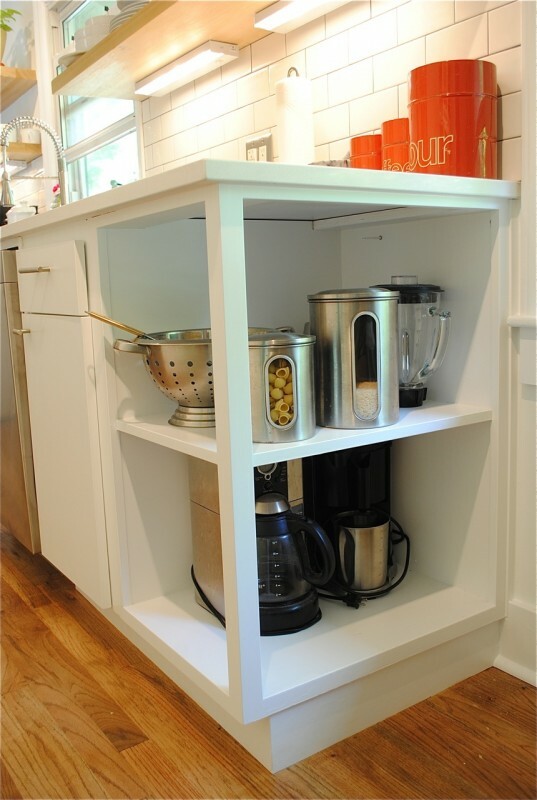 Lower open cabinets to hold bigger items. I don’t know why I have the coffee pot and the juicer so snuggled up. And look at that nail sticking out! HA. Eric, come back and hammer that in, ‘mkay? 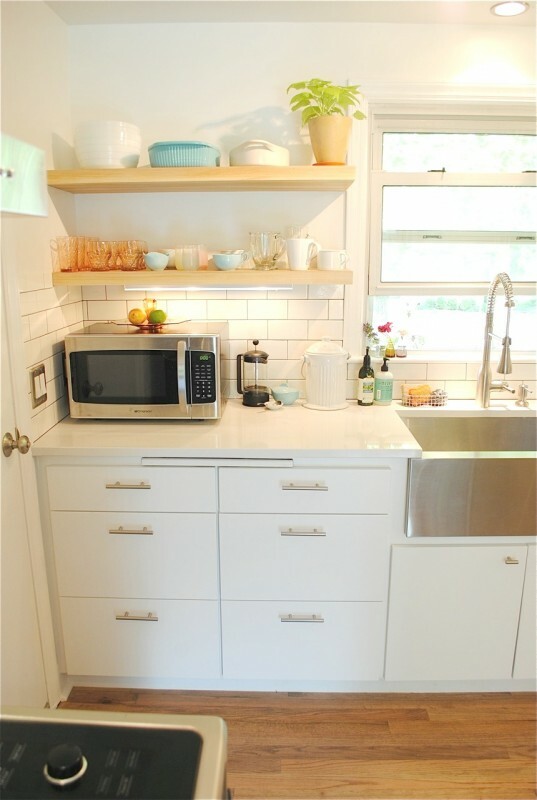 White subway tile. Our bathroom matches. These things can’t be helped. 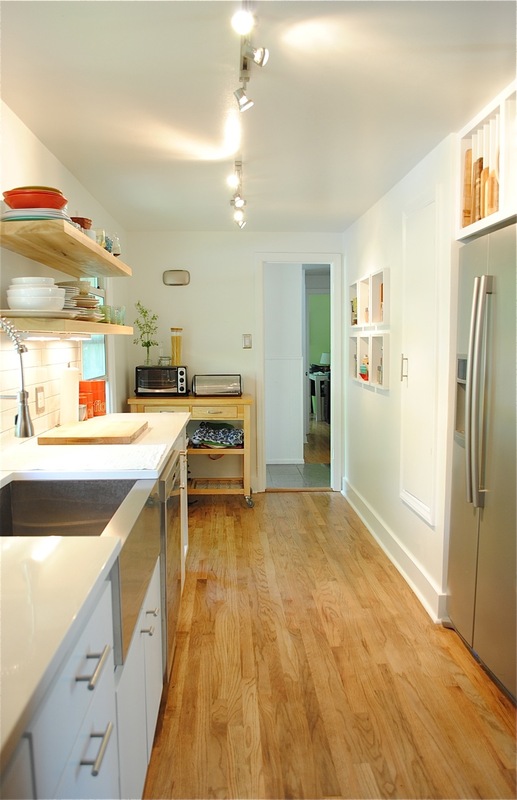 Check out that recessed light over the sink. LIGHT. Real life light. The area below the microwave used to be two long shelves, but we had custom large drawers (that soft close!) built so that I don’t bust a vein when trying to reach my heavy cast iron in the very back. Aaron is building me a pot rack this weekend. This is considered PART DEUX of that whole risking the marriage thing. We kept the electric range, but Eric went ahead and got me set up for gas, for when I go out this weekend and surprise Aaron with a new gas range. OH I’M KIDDING. I had to show you this pee-ummmp hood because it’s just so dang pretty. And there’s no grease under there. Yet. See that storage above the fridge? It was a total random last minute vision by the dudes and within a few hours it came to life and I squealed a lot. Oh! My calendar is out of date. I need to change that real quick. Hold on. Okay, my feng shui is back in order now, WHEW. 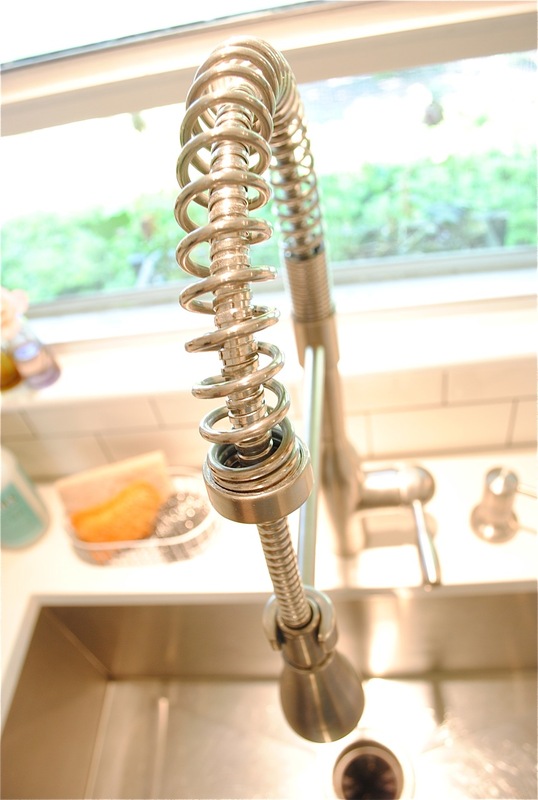 This coiled industrial faucet was the very first thing we bought and I slept with it for a week straight. See that little button to the right? That’s the garbage disposal button. Sounds like feathers tickling your heart. This sink makes my life so good. And this! These wall niches were also a random vision from Aaron and at first I was like, whatevz, but I die now every time I look at them. I’m absolutely in love. This little corner will be addressed this weekend. PART TROIS of the marriage risking thing. 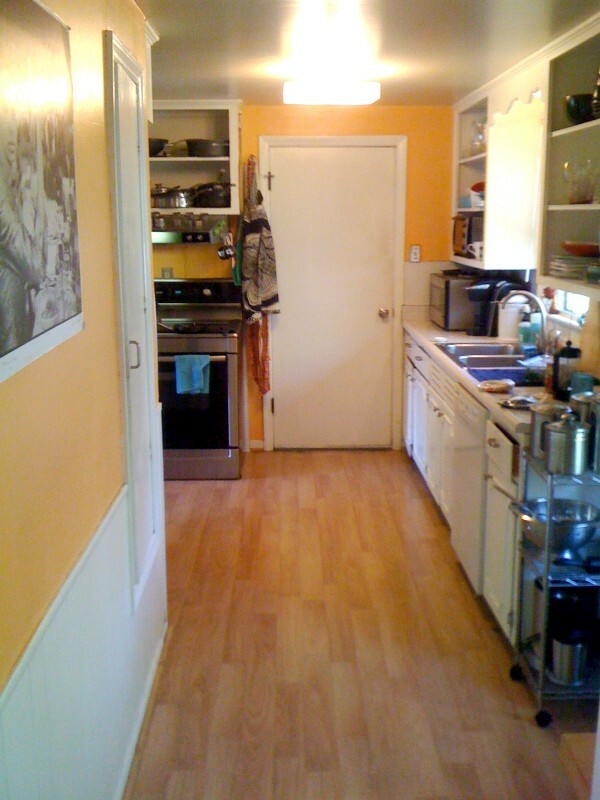 And this is the kitchen from the other end of the room. The stove and hood are to the right, in case you needed MY AID. And there you have it! My new kitchen. That I will never leave. So don’t even try and make me. * Eric, I mean seriously. You rule it. * Laura, for lending us your man for 2 weeks. * Aaron, for keeping me calm and making me realize that you actually DO have good ideas and are smart and wonderful. Now if you’ll excuse me, I’m going to go take a nap on my new quartz countertops. Breathtakingly beautiful, Bev! So happy for you!! 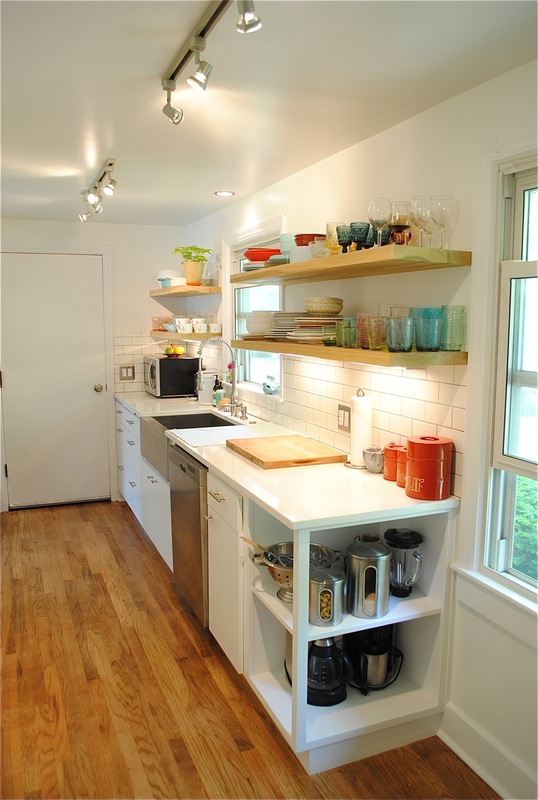 The cutting board slots, the floating shelves and the recessed lighting underneath - Genius all around. 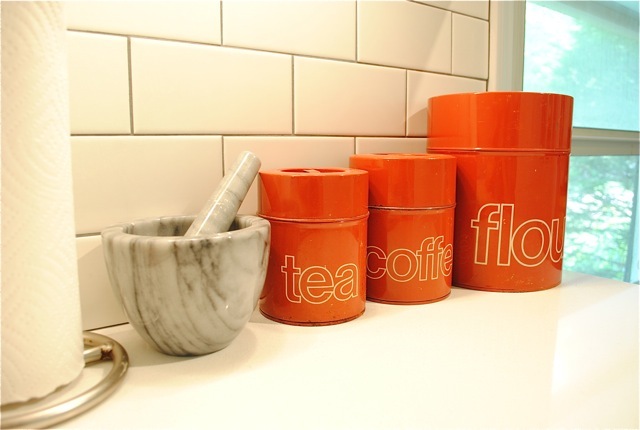 Then BAM - pops of color and subway tiles everywhere? Magnificent! Can I come cook with you? I'll clean. Deal? Deal. This is so pretty! I love how open and organized it is :) And, I have one small cupboard over a piece of countertop set aside in my kitchen. We call it the coffee nook. I'm fairly certain it was the very first thing I unpacked and organized when we moved! STUNNING!!! ROCK SOLID GORGEOUS!! So bright, so you guys, so perfect. LOVE IT!! And so happy you now have a beautiful kitchen to make all of those wonderful dishes sing, entertain all your wonderful friends and family, sing, dance, drink and be merry. xoxo Jenny BTW...........Aaron and Eric - UNBELIEVABLE JOB!!!! I have such kitchen envy right now, mine seems like a dungeon in comparison. And look at all that storage. Wall niches FTW. Gorgeous!!! Congrats!!! Wow. AMAZING. Come do my kitchen. omfg this is STUNNING!! I LOVE THIS!! I love it! It is absolutely beautiful. Great job!! Beautiful!! And I'm in love with your sink big time! I love your kitchen! I NEED your tile! Would you share your source (I'm in KC, too)? Also, the faucet is my new boyfriend and I need to know where to find him, too. So glad you asked! I'm totally happy to share sources. The tile came from Lowe's and the faucet came from Home Depot! Or Lowe's. One of the two. Good luck! Holy gorgeousness!! 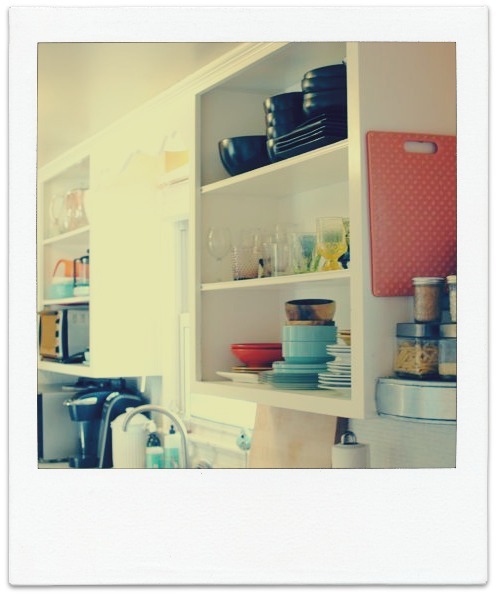 I love the open shelving and storage - obvi your dishes are too cute to be hidden. Nice work and congrats on your new addition, it's just lovely! 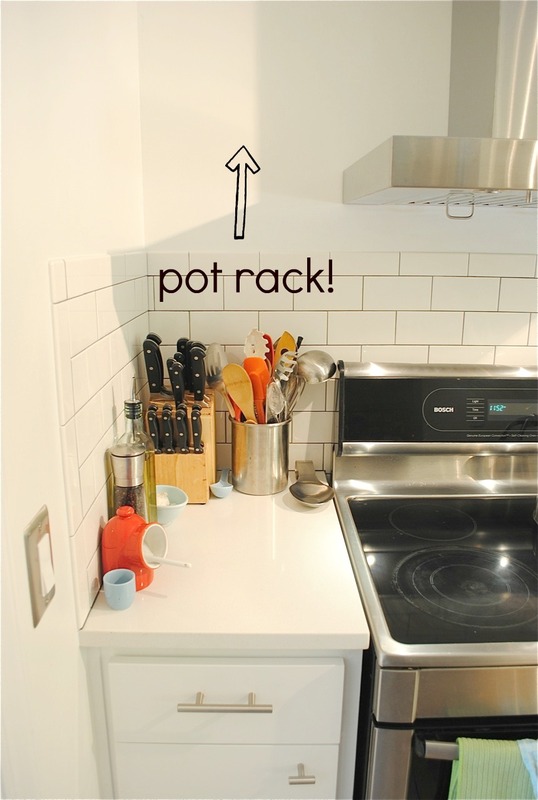 I LOVE the wall niches! Congrats on your beautiful new kitchen...may you cook many wonderful meals and create beautiful memories! Bev, this is fantastic! I can't pick my favorite part... I love the everything you all did. I LOVE IT!!!!!!!!! I want to come over and see it for myself....and hang out at that coffee station with you. Amazing! I love love love it! It looks so good in all white. Great new kitchen! I love, love, love the sink and I agree the faucet is fabulous, my incredible sweetheart installed ours a few months ago :) (Amy, we found it at Costco) Happy cooking!! we need a photo of the life changing scrubby! Oh goodness! 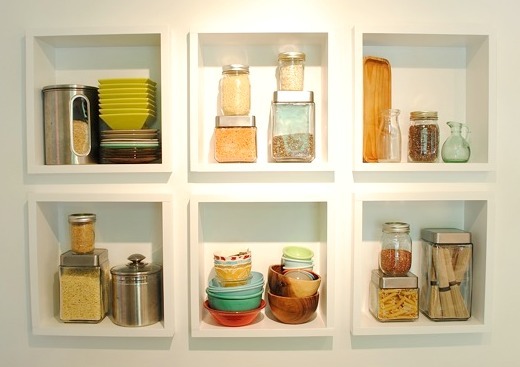 Those built-in shelves! 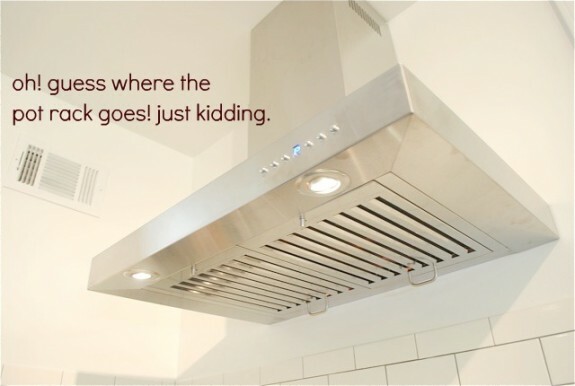 The stove hood! I miss my big tub sink. Waaaaa. The door pulls are awesome. Do angels sing every time you enter? LOVE. IT. ALL. Bev, I absolutely LOVE the new kitchen! Seriously, love reading your blog. You sure know how to make a gal laugh out loud at work! Good luck on part one and part two! FABULOUS!!! you are never going to leave the kitchen! I am in love with those cutting board slots. Absolute love. Beautiful makeover!! OOOOOMG! I'm sitting here just clapping my hands & giggling for you! That kitchen is gooorrrrrgeous! I absolutely love it... the transformation is amazing!!! You should have a kitchen-warming party!! :) So happy for you!!! Ohhh, you're giving me the remodel itch!! I LOVE your little cubby window box thingy's (too lazy to scroll up to see what you called them). I have a huge section of wall in my kitchen with NOTHING and I'm not sure what to put there. Those would be so cute :) Congrats!!! Oooooooooooh lala! It's absolutely STUNNING Bev!! Congratulations!!! Bev, congrats! It's just stunning! You survived and hopefully the "after" makes the process worth it...it's spectacular! 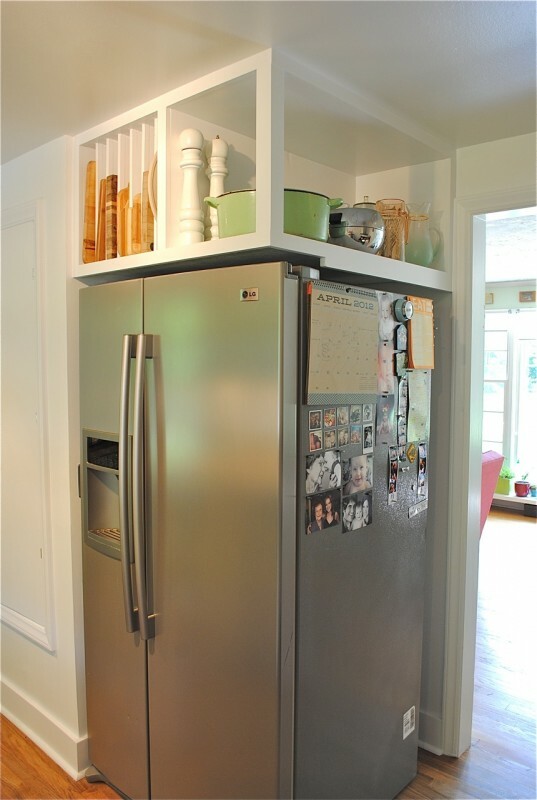 Love the stainless and white and how light and airy & modern it is. Fantastic! 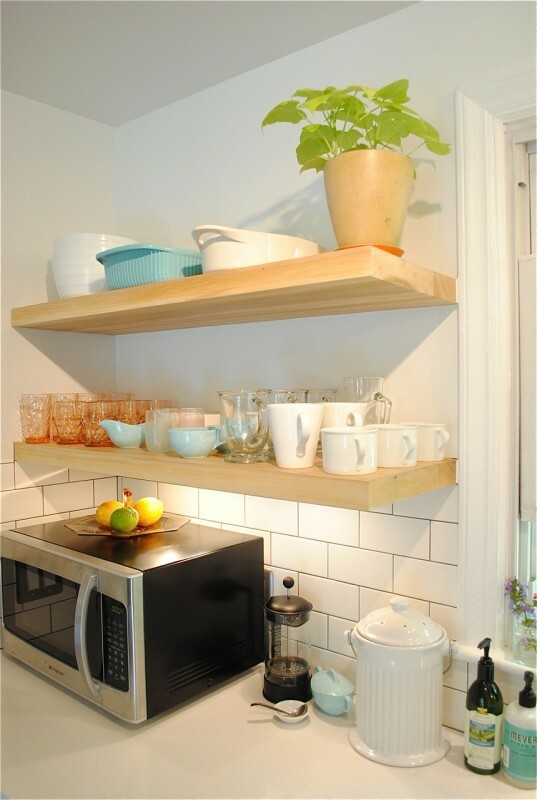 I love the open shelving and those niches are to die for! Great job! I can't even. This is my first visit to your site and already I know our online friendship will be based on jealously. Brilliant!! So pretty Bev!! I don't blame you for never wanting to leave. Perfection! Beautiful, nice job, good work, and I hope you are cooking 2 amazing carpenters some lunch/dinner. amazing!! I'm seriously jealous over that faucet/sink/garbage disposal magic button. SO perfect!! 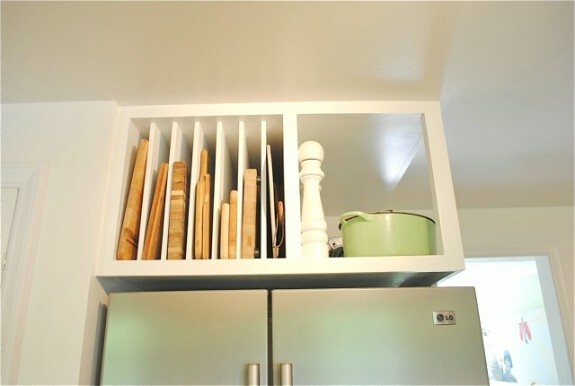 The cutting board slots would totally put me over the top. Beautiful choices! That looks awesome! It must be such a huge relief to be in the home stretch! Gorgeous! I am so jelly! Love, love, love your new kitchen! Congrats! Holy beautiful kitchen, Bev! Can I come live in there? I'll bring a sleeping bag and dream of a white subway-tiled kitchen of my own. Seriously, it's so beautiful and light and clean and perfect. Way to go, Weidners and Eric! Yes, yes, yes! So happy for you! It is amazeballs. It look FABULOUS!!!!! Probably the best kitchen remodel I've ever seen. I love the white white white! I'm so glad you got this finished in time for me to come visit. ps I'm moving in and you're cooking for me 3x/ day. Plus snacks. Don't you remember this deal we made??? Freakin' gorgeous!! I just want to marinate in there! Yes, where is the life changing scrubby?? OHHHHHHH BEVVVVVVV! This is a MAGNIFICENT reno! I. Want. It! What a fab job you guys did with absolutely every detail (even the famously invisible potrack!). Happy cooking, friend! Can't wait to see the kitch show up in the backgrounds of some Tablespoon posts! CONGRATS!!!!! this looks amazing! cant wait to see what amazing goodies come from the new kitchen! It's so bright, sleek and cool just like you! Love it! But where is the cute little dish scrubby?? OMG did something happen to it during the renovations? Was it hurt? Injured? Worse... killed? WTF happened to the cute little dish scrubby, Bev? What? By not answering you're only incriminating yourself even ~more~! Ohhhh that little dish scrubby was history back in late Jan! I go through scrubbys like a cheetah goes through...well, what do they go through...rabbits? Small dear? Something? I have since bought new cute dish scrubbys though! ALL IS RIGHT IN THE WORLD. Absolutely fantastic, congrats and enjoy! I've been losing sleeping waiting to see this post! Bev, it's beautiful. Like please-let-me-move-in beautiful. You should totally submit it to Young House Love. Top notch quality going on. Congrats on being done! Woo hoo! I love your decision on the countertop, is it marble or Caesarstone? And 2 weeks? 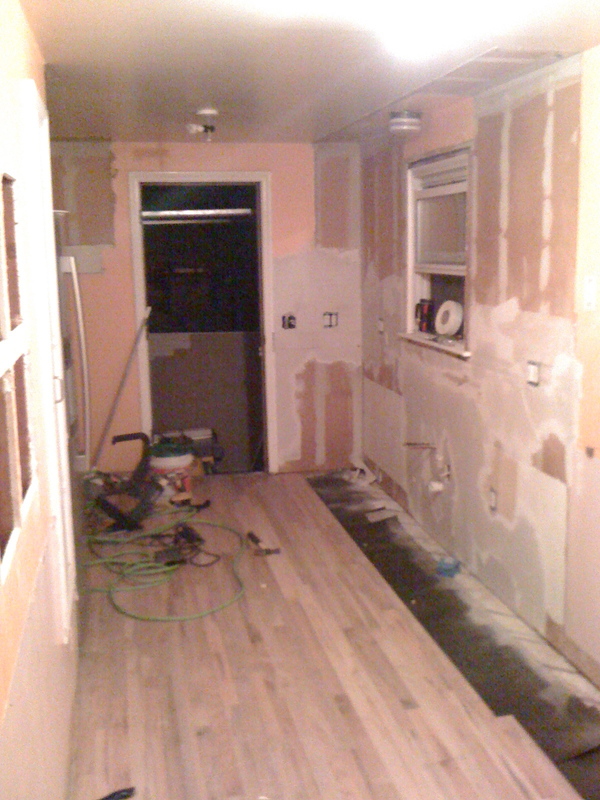 World record kitchen remodel. Can't wait to see what comes out of it! Yeah to both of you. You throw the word "plant" around, when you should be thinking "fresh herbs growin' in a pot at arm's length". I know, your focus all along has been that magic disposal button, but admit it, in the grand scheme of things you really miss washing dishes in the bathtub, don't you? 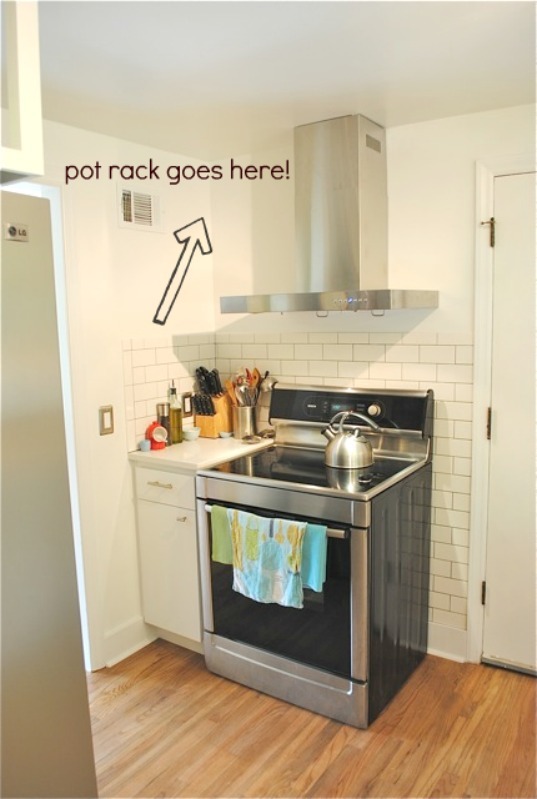 BTW... where exactly are you planning a pot rack... heh-heh. WOWZ!!!!! That deserved the z behind it.... it's just beautiful, you lucky girl :) and can i just say you one funny chica, when can we hang?? Love it! It looks beautiful! 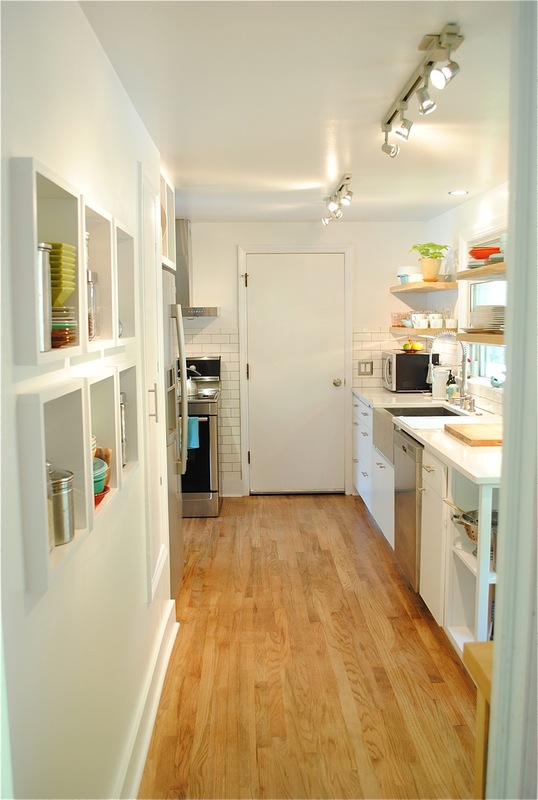 I love the floors and the cutting board slots I so want! Great job and congrats! Love, love the new kitchen! Beautiful, bright colors! 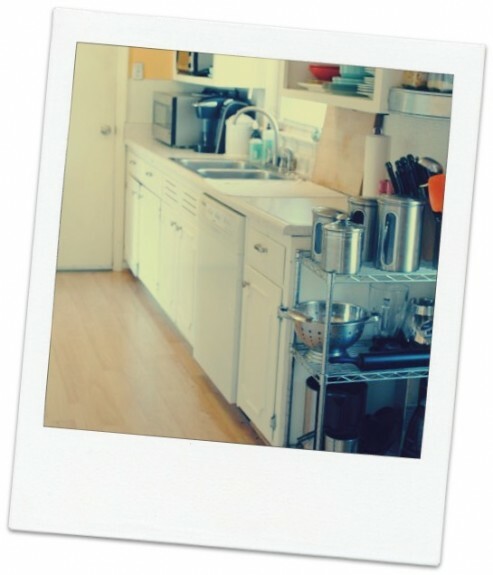 Love the floors, countertops, sink, everything.... especially those precious pics on the side of your fridge. My hearts stopped when i saw the pics of Memaw and Breckon! Love ya and so happy for ya'll!! Beautiful!!! I love how it's white and fresh-looking. I just love new kitchens! Really nice! I love that hood. Everything turned out fantastic!! I'm so impressed that you husband is so handy! I really love how you utilized all your space! I know you will have so much fun cooking and baking in your new kitchen!!! It's so dee-vine I want to puke. In a good way. Congrats!!! Looks great - what a lovely kitchen! It looks amazing! I am in LOVE with subway tile. oh my goodness. It is BEAUTIFUL!!!!! Love the coffee station. LOVE the cutting board slots. Love where the pots are going to hang. LOVE the faucet and the huge sink. Oh my gosh. 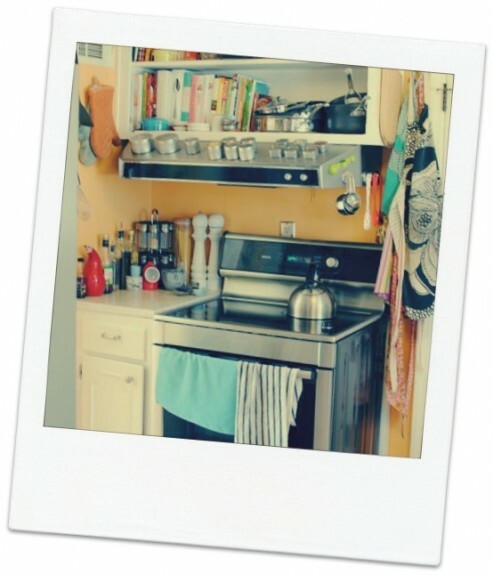 Love your whole freaking kitchen. so happy you survived this. so worth it. I have to admit, I don't miss the orange at all. I am loving those subway tiles! Makes the kitchen! It looks really amazing, Bev! Good work. If I move in and just live in the coffee station, would that work? I'm pretty good at making coffee. Oh now you've started it. My hubs is gonna be in SO much trouble!!! LOL My kitchy is old and I mean 16+ years old. Oh its really nice and all... two ovens, two side by side frigs but lets face it 3 of my appliances are gimping. Guess what honey? Its almost time for a new kitchy!!! Think your friend, the contractor from CO would come to COMO? he he Beautiful! I know you are thrilled to have the bright white, clean and brand new kitchen. Wowza you are a lucky girl!!! May you enjoy making many many meals for your man! Congrats! Eeeeets soooo purrrrty. Just like you. Little golden blonde, tanned, and peppy you. Whatever did the blogosphere do before you?! XO. Oh my word!! That sink, those tiles.... Love it. This is absolutely gorgeous! 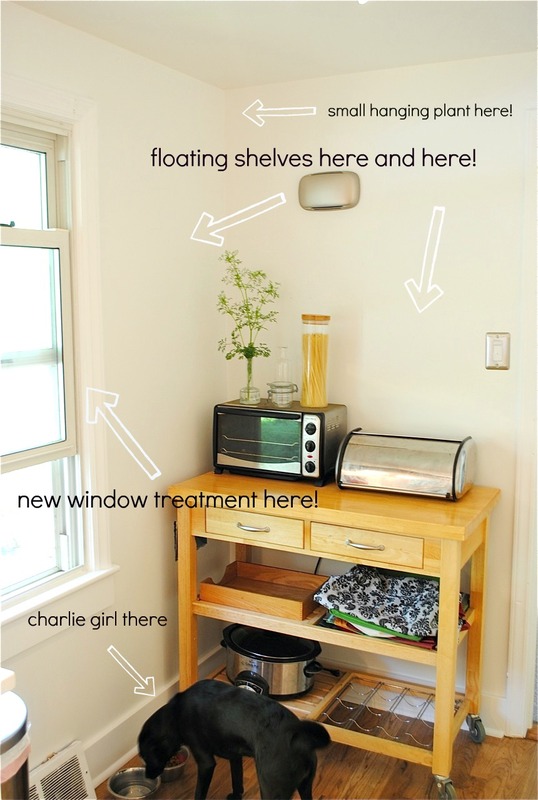 I am in the process of remodeling my kitchen and this is so inspirational! I would love to know the brand/where you bought the sink and faucet? Hi, Lisa! 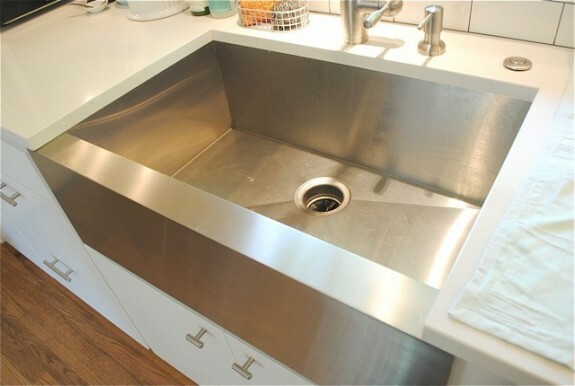 We actually got the farmhouse sink on Amazon, (I can't remember the brand, but just do a search for stainless farmhouse sink and you should find something!) and faucet at Lowe's! This is AMAZING. In love.